It will take some time to adjust my FSE thread to this forum. The 22nd (Cheshire) Regiment of Foot is a North American regiment dedicated to skill, discipline, and fun. The 22nd was formed in January 2014 out of the remnants of the 44th East Essex [NA], after it was disbanded. The 22nd is comprised of former 44th members that were left with no where else to go after the disband occurred. So, they took it upon themselves to uphold the same values that the 44th East Essex [NA] was founded upon and continue its traditions by forming the 22nd "Red Knights". We thank Murphy and our brothers from the EU 22nd Regiment of Foot for allowing us to share their name in the New World. We are a line infantry regiment that pride ourselves on being serious and disciplined. Having fun is a huge factor for us, though, and that will never be compromised by overly strict rules or policies. After all, we play this game to have fun. We're looking for people who strive to be in a professional and skilled environment. You must be dedicated to our cause and regularly attend events. If you match these qualities, then you will fit in perfectly. We are classified as line infantry and seek to build a formidable regiment on that basis. However, we do regularly play the role of artillery and skirmishers in line battles. As such, we are also currently recruiting members for our artillery company. Whether you wish to regularly attend line battles as an infantryman, hone your skills as an artilleryman or harass the enemy as a skirmisher, you will be at home in the 22nd! To join the regiment in Mount & Blade Warband: Napoleonic Wars, go to the website and click on the "Apply Here!" button on the navigation menu. There is a hard requirement of being at least 16 years of age to be accepted. We accept new players as well since part of fostering a better community is guiding the new players in the right direction. 1. No trolling or harassment in-game or on TeamSpeak. No spamming, insulting behaviour, any kind of discrimination, racism, bigotry, making unwanted noises, etc. 2. Be respectful to everyone, including opponents. Do not trash talk other regiments or players and do not ever retaliate to insults or to being team killed. Stay cool. 3. Conduct yourself in a professional manner in events: no head-banging, stay in line, and keep your weapon at your shoulder, and face the direction that you are told. 4. Follow Orders. Do not contest the orders of the officer. If you disagree with an order, wait until the event is over and ask to speak with the officer that was leading. 5. All members should make a conscious effort to attend all events possible. Attendance rating is certainly a factor when promotions and demotions are considered. 6. Any attempt to undermine the regiment will be met with harsh disciplinary action. Punishments range from demotion to removal from the regiment. 7. Try to recruit at least one person every month! If we get 10 applications and only 5 of them are any good, that still makes us 5 men stronger! 8. If you have issues with anyone in the regiment, then you should contact Amit first. If you cannot talk with him, speak with Farmer. While the 22nd Regiment of Foot was not directly involved with the Napoleonic Wars, it has earned its own host of achievements over the course of history. 1758: Took part in the siege and capture of Louisbourg, Nova Scotia during the Seven Year's War. This put the Maritimes back into the hands of the British and opened up the opportunity for incursions into Quebec. 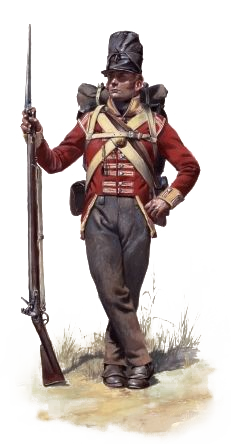 1759: Grenadiers from the 22nd regiment were combined with grenadiers from the 40th and 45th regiments to form the Louisbourg Grenadiers. They were assembled to eliminate the French presence from Quebec. The Louisbourg Grenadiers captured and held Quebec City after the Battle of the Plains of Abraham. The French defenders routed and were not able to retake the city after it was surrendered to the British. 1760-61: Participated in the expedition to capture Montreal under General Jeffrey Amherst. Shortly after the taking of Montreal, Canada was conquered by the British and all remaining French forces were to stand down. 1762: The main fighting force of the 22nd deployed from Louisburg and Quebec to the West Indies where they took part in capturing the island of Martinique, a highly valuable source of sugar. The 22nd regiment also participated in the Battle of Havana to disrupt Spain's ability to use Havana as a staging area for amphibious attacks. 1776-77: Participated in the New York and New Jersey campaign, a series of battles for control of New York City and the state of New Jersey, resulting in British capture of New York City and the retaking of New Jersey by American Revolutionary forces. The main line companies occupied Newport Rhode Island, participating in the Battle of Rhode Island. 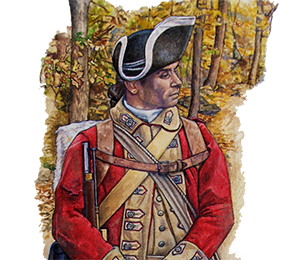 Eventually its light infantry company was sent to participate in the Philadelphia campaign in 1777. All questions should be directed to the contacts mentioned just below the Rules section.